For the month of June, I had begun reading Pilgrim's Progress by John Bunyan, as a part of the Booking It series, but I couldn't get through it. I think it is because I just finished a few years of "required reading" for school, and Pilgrim's Progress is a meaningful book that needs significant thought and I don't have the patience for it right now. Hopefully I'll read it later on, as I have heard wonderful things about it. 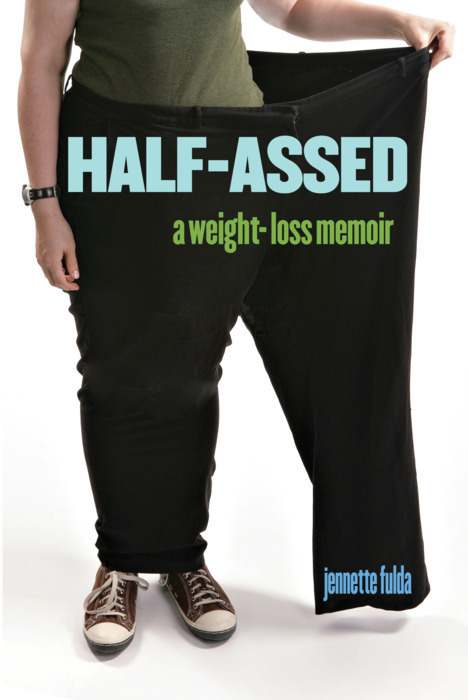 Instead, I read Jennette Fulda's personal weight loss story called, Half-Assed: A Weight-loss Memoir. Fulda kept an online journal/blog and it was the starting point for this book. Fulda is very real about her 192 pound weight loss journey. There were a few events that led to her realizing she needed to lose weight (you'll have to read the book to find out the specifics). Her family members were also overweight and it was something they never spoke about. She mentions she wasn't one of those girls whose mother constantly nagged her about weight. She purposely wouldn't tell the readers what weight loss method she used, as it wasn't just one specific thing she did to lose the weight of a whole person. I appreciated that she addressed the fact that successful weight loss only occurs when you consistently practice good eating and health habits. Three years ago this month, in a department store fitting room, I saw the cold reality that I had gained a lot of weight. I had tried to lose weight before, but my motivation to keep healthy habits would quickly wane. I could stay on a diet for a few weeks, maybe a month or two, but then got burned out and would gain the weight back. This time though, it was different. I was really bothered with how I had so easily "let myself go". Unlike, Fulda who said she had never tried a diet, I had and it was shocking how fast I was a plumper version. Fulda wrote about the emotional, psychological, and physiological effects weight loss had on her. I could relate with what she said, because I had experienced, on a smaller scale-no pun intended :-), what she described. Choosing a parking spot further away from a store's door added physical activity to Fulda's day. Learning how to cook, instead of using the microwave or fast-food driveways, enabled her to lose even more weight. One of my favorite points she made was that she would only do something she could sustain. Taking the stairs at her office was a starting point to increasing daily exercise. She wrote that baby steps mattered and they added up to bigger things. Whether or not you have struggled with your weight, Fulda's writing will give you a picture of a successful weight loss journey. It is an entertaining read and there were points I laughed and cried because of her sincerity. I hope this post has given you more of a desire to read the book, I definitely think you will like it.